Search Multi Tabs is a new extension for the Firefox web browser that enables you to search across all open Firefox tabs at once. Veteran Firefox users may remember extensions such as Tabby2 from 2011, Findbar Tweak from 2013 or Hugo Search All Tabs from 2013 which offered the same functionality. All of these extensions are not compatible with Firefox 57 anymore as Mozilla removed support for the classic add-on system in that release. 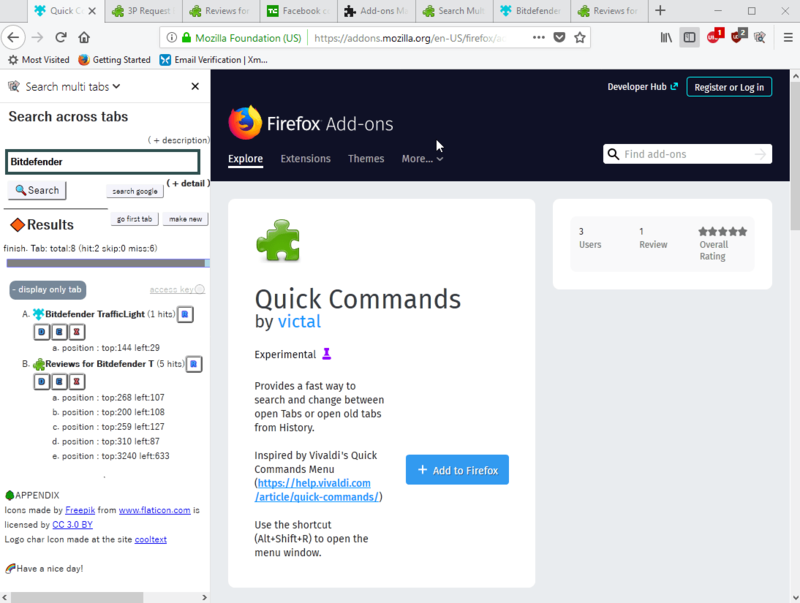 Search Multi Tabs is the first WebExtensions-based extension for Firefox that supports searching across all open Firefox tabs. The extension adds a new sidebar to Firefox when you install it. It opens automatically after installation but no shortcut key is mapped to it. You may use the extension's icon to open the search interface. Use the View menu of the menubar (press the Alt-key to display it), or an existing shortcut such as Ctrl-B, to open the sidebar alternatively. Search works as you'd expect it to. Enter a search term and hit the search button to get started. Search Multi Tabs searches all open tabs and displays the hits in its interface. It displays the favicon and title of the page, and buttons that you may use to interact with it. Use the buttons to reload a tab, close it, duplicate it or to erase the list. Buttons are provided to go to the first tab or to open a blank tab. Hits on the page are listed below each entry which you may click on to jump to that position directly. A click on details displays search parameters that you may modify. The extension searches the body by default, and you may enable "highlight", "entire word" and "case sensitive" parameters for that search type. You may switch to "title or URL only", and also include private browsing tabs in the search. The extension searches loaded pages only. If Firefox is configured to lazy load tabs, only those that are loaded will be searched. Search Multi Tabs is a useful extension for the Firefox web browser to run searches across all open tabs in the Firefox web browser. Firefox users who open lots of tabs in the browser may find it more useful than users who run one or only a handful of tabs at a time. Now You: Do you use search extensions for your browser? I’ll test it this weekend. Tested, very nice extension for Firefox 58.0.2. I miss Findbar Tweak the most, especially the feature: Search for text when I start typing. Nice to see we’re (ever so slowly) getting fixes for a few things that were broken in FF 57, even if they’re clumsier in terms of usability and not easy on the eyes… Sarcasm off. I’m finally back to Palemoon and what a relief it is. I had forgotten how smooth and responsive Firefox used to be. Everything just works without having to mess around with stuff like Classic Theme Restorer. Even my old favourite, the above-mentioned Tabby2 is working again… I do miss a few improvements in later versions of FF, but the overall trade-off is excellent. You don’t need an extension to search your tabs. Just type a percent sign (%) followed by a space, followed by your search term.